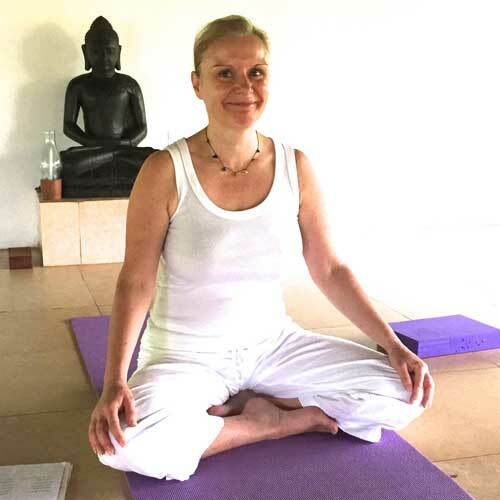 Jackie has been practicing yoga for over 20 years and qualified as a teacher with the British Wheel of Yoga in 2006. She has practiced in a variety of yoga traditions, and with many senior teachers, all of which have influenced her teaching style. Jackie believes that yoga should be accessible to all and beneficial for everyone. She teaches all levels from beginners to advanced practitioners. Postures can be adjusted and alternatives offered to allow for any physical challenges, injuries or medical conditions. Equally, extra challenge is offered for those who seek it. Her classes offer benefits on many levels: physical, emotional, mental and spiritual. On a physical level the postures work with the skeletal and muscular systems, helping us to stay (or become) fit and healthy. The postures also benefit all of the body’s systems resulting in healthy immune, nervous and digestive systems. Jackie has a keen interest in Mindfulness and also draws on teachings which encourage a quality of attention, perception and awareness, helping to still the mental chatter and provide clarity and focus. The use of the breath is central to the teachings. Whilst the philosophy of yoga is thousands of years old, it is still very relevant in the world today. Jackie’s teaching style draws heavily on yoga philosophy, which she weaves throughout the classes. She will help you use your yoga as a tool to enhance your daily life, enabling you to better handle the challenges we all face in day-to-day life and to realise your potential. Jackie loves India and has been a guest at Kailasam many times. She is delighted to be teaching at Kailasam for the third time.